Our Business Services include business office projects, administration, financial, and virtual assistant services. - Get a competitive quote! Remotely, we can handle all of your office projects: marketing, business reporting, graphics design, company newsletters, PowerPoint slides, typing projects, etc. Learn more about our Business Services. Got an outdated, worn out business form or need an Excel file? Let us create it for you! Prices start at $25 depending on the project. We customize Business Forms, Certificates and more. Think of us as your virtual office assistants or temporary office help when you need it. Grow your business and complete projects quicker! Read more feedback from our customers. 9.29.17 - Pardon us while we add a shiny new secure SSL Certificate. Register your domain name with Hoover for $10/yr. Web Hosting starts at $6.99/mo. Promote your site in the Search Engines. We offer many free business forms for business owners such as: business receipt forms, printable invoices, sample business legal documents, free printable signs etc. Welcome to Hoover Web Design. We specialize in Professional Web Design and Website Development, Small Business Services, Web Templates, Web Hosting, Domain Name Registrations and Search Engine Visibility. Using the Internet, Hoover Professional Web Design eagerly helps businesses and individual clients all over the World to establish and maintain a professional Internet presence. Hoover Web Design strives to create professional web site designs that will effectively promote our clients products and services to their target audience. Our eye-catching and professional web site designs will make your website stand out to your site visitors and accomplish the website goals you have created! Ask to view a list of websites created for examples of our work. Get A Free Quote On Your Web Site Design Project. Social Media Marketing Management - Let us market your business, products, services on social media such as Facebook, Instagram, Twitter, Google+, etc. Last updated 03.10.19 by Hoover Web Design. © 2000-2019 By Hoover Web Design. All Rights Reserved. 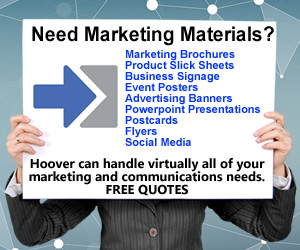 The Hoover Web Design (https://www.hooverwebdesign.com) web site may not be reproduced, copied, or downloaded without permission of Hoover Web Design/Gina Hoover. This site may contain third party advertisements which are not representative of Hoover Web Design.